Here at the Arun Leisure Centre we follow The Swim England Learn to Swim Pathway, meaning your child will be following a nationally recognised syllabus and awards system produced by swimming’s governing body. 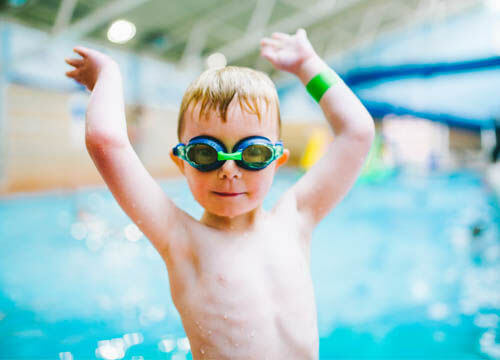 The world renowned 'Learn to Swim' programme is used in over 1,000 swimming programmes in the UK and internationally and has already taught millions of children to swim. It continues to be by far the most successful grass-roots programme in British sport. The Learn to Swim programme maintains a focus on 'teaching the correct aquatic skills' to help the children develop the skills they need to become competent swimmers. Children are guided from the Swim England Discovery Duckling and Duckling awards to get babies and pre-school children started and progressed through to the 'Learn to Swim' programme, where they are taught more advanced techniques. The Swim England Awards support the Swim England Learn to Swim Pathway. Covering all ten stages of the syllabus, the colour-coded badges and certificates have been designed to reward and encourage children to learn the core skills of each individual award stage, as well as ensuring that they have fun in aquatic sport. All instructors are Level 2 ASA or Level 2 STA qualified with experience and are fully trained to deliver the Swim England swimming lessons. All the instructors are DBS checked. Instructors will give feedback via the swimming coordinator on your child's development as well as their progress through the awards system. Be Water Confident - this Award is about gaining the confidence to enter the pool safely. It also covers the ability to move around the pool with confidence and to achieve basic core aquatic skills. These are entries, exits, buoyancy, balance and aquatic breathing. Be a Swimmer - by the time you earn this Award you will have the necessary skills to start swimming independently over short distances (5 to 10 metres). You won't need support or swimming aids. Be a Better Swimmer - by this point you'll be able to swim up to 400 metres independently. You'll also have the confidence to try other pool activities, such as Aqua Aerobics or lane swimming. Be a Master Swimmer - gaining this Award means you can confidently entre the Masters secion of a swimming club. It's about more advanced swimming skills to enable you to compete. What age can children start learning to swim? Children can start to gain confidence in the water and get used to the swimming pool environment from as young as 3 months. How do I find out about lesson availability? Come into the Arun Leisure Centre or phone us and we will find the right level of class for your child. Lessons run 7 days of the week and we will help you to find a convenient time for you. At the Arun Leisure Centre our pre-school lessons run for 42 weeks of the year and our after school lessons are run 50 weeks of the year. There are 2 payment options; monthly via direct debit or a one-off payment for the 50 weeks at the start of the new Swim Academy year (January to December). Do I need to get in the water with my child? An adult is required to be in the water with their child in the Adult & Baby and the Adult & Toddler swimming lessons. The instructor will also be present in the water. In the pre-school lessons (3 & 4 years) the child has their lesson with the instructor present in the water (no adult required in the swimming pool). Once the child moves in the 'Swim Academy' the child will be taught in the water with the instructor on the poolside. Do you do adult lessons? Yes we do water confidence, be a swimmer and be a better swimmer on Wednesday mornings, Thursday lunchtimes and Thursday evenings. We also run an Adult Master Swimmer group on a Tuesday evening. Do you do 1:1 lessons? Yes we do a variety of 1:1 lessons throughout the week in both the learner pool and main pool. Please ask at reception for availability. How do I cancel my swimming lessons? Also important to note: Our 50-week lesson programme has a 2-week break through December. Swim School fees are made by Direct Debit with unlimited swimming included for our Direct Debit members in all open swimming sessions. Swim School also offers Crash Courses during the school holidays. These are ideal for additional support or learning new aquatic skills. which level swim school are you enquiring about?